Normally, ongoing titles see a drop from December to January — and a much more sizable one between second and third issues. 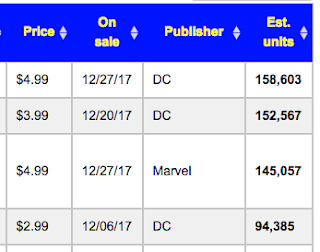 But Doomsday Clock #3 saw its orders from December decline by less than a thousand copies, shipping nearly 158,000 copies to comic shops in January. 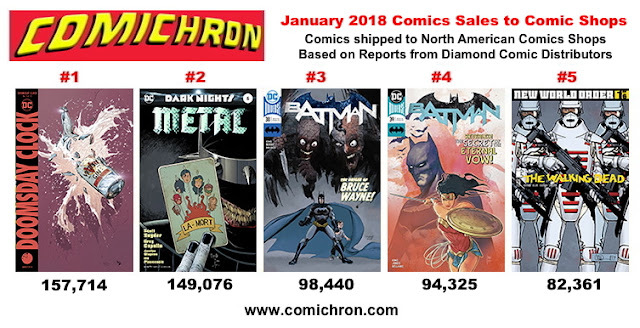 That's according to our estimates for sales of comic books and graphic novels to comics shops in January 2018, now online here. As reported here on Friday, a fifth shipping week in January helped the month to the smallest drop in Direct Market sales to since the previous spring, just under 2%. 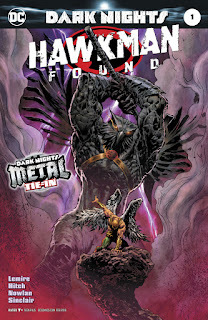 DC had a strong opening to the year, with dollar sales up 15% over its total from the previous January — and we can now see that it had a notable success story in Hawkman Found #1, which released the last week of December with 64,600 copies shipped. The book was the top reordered comic three weeks in a row thereafter, moving more than 22,200 more copies in January and nearly cracking the Top 100 again. Marvel was off year-over-year, but only by high-single digits against what was a very unusual month for it: January 2017 was the month that Marvel offered free overships of its entire line, distorting that category of the charts. The publisher's sales for Avengers #678 were divided between the regular $4.99 issue in sixth place, and a $3.99 special in 282nd place; that latter edition's dollar ranking reflects that it was shipped as a free premium. If combined, the issue would have placed fifth. The series had three more weekly issues release. It's been a busy week for Comichron, and not just because our other report on Friday, on the end of DC's newsstand sales, quickly became one of our three most-read blog posts. In addition, we've just added something that people have been asking for for a long time. We now have included on-sale dates in the monthly charts, starting with December 2017. There's a reason for the addition now: Diamond began reporting the Top 500 comics in December, which brought a number of reordered and liquidated comics onto the list. The dates serve as a necessary aid to identification. An excerpt from December's updated chart. Sorting by date is one method of isolating the new comics from the reordered ones; you can also look just at a specific shipping week, getting a sense for how titles with more weeks on the shelves benefit. Much of what is assumed is "attrition," for example, is often a function of comics simply not having as many calendar days in which to sell. Sales in the following month may make up the difference in many cases. Some of the on-sale dates are after the original ones for the comic; that usually suggests that the issue is a later printing. We see a number of those among the liquidated comics, as supply finally exceeded demand for certain books.